A rectangular aluminum top and shelf are framed in the wire brushed natural finish wood of this accent table. 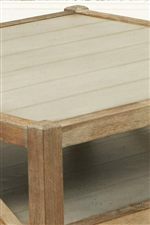 Straight legs, simplistic lines, and basic side stretcher accents make this end table a casual living room piece. Give your home a cottage feel with this occasional table's calm lines and shapes. The Ketley Aluminum Accent End Table with One Shelf by Largo from Bullard Furniture. We proudly serve the Fayetteville, NC area. Product availability may vary. Contact us for the most current availability on this product. 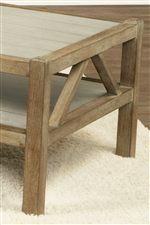 The Ketley collection is a great option if you are looking for Cottage furniture in the Fayetteville, NC area.